mottled buff-brown; pointed tail lacks longer tailpins; whitish belly. Non-breeding male like female, but mantle greyish. In flight, pointed tail between feet distinctive. Highly gregarious; extremely common on vegetation-covered jheels; males often in separate flocks, especially on arrival in winter grounds; crepuscular and nocturnal; characteristic hissing swish of wings as flock flies over. shoots, seeds of aquatic plants, rice, also water insects and molluscs. winter visitor across the subcontinent. The Northern Pintail is a common wintering duck in our area, arriving as early as September and leaving in from March to April, with stragglers as late as June. They breed throughout northern Asia as far north as there is land. They are rarer in Europe but also breed in North America. 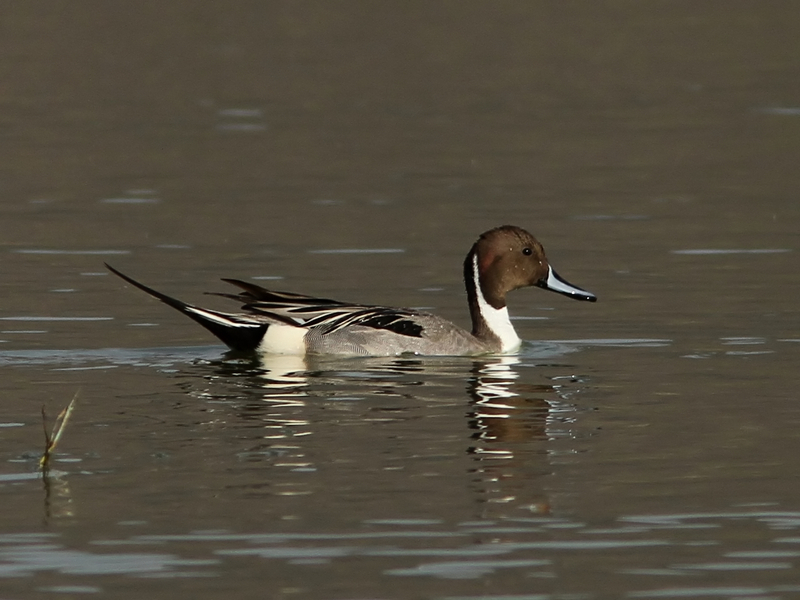 Pintail are sociable birds, mixing readily with other dabbling ducks. They are found mainly on the larger wetlands although a few do occur on village ponds. As they feed mainly by upending, they prefer rather deeper water to other dabbling ducks. They eat mainly aquatic vegetation and will make nocturnal flights to graze on cereals and grass. The Pintail is among the most elegant of ducks as well as being one of the largest. Both sexes share the long slender neck and attenuated tail (although the male’s pin is much longer) which makes them easy to pick out when swimming high on the water or in their very fast, and usually high, flight.